Street and stormwater litter conditions vary across the City, with the TTF and Cobbs Creeks having the worst creek trash problems while the Pennypack and Wissahickon Creeks having less creek trash. 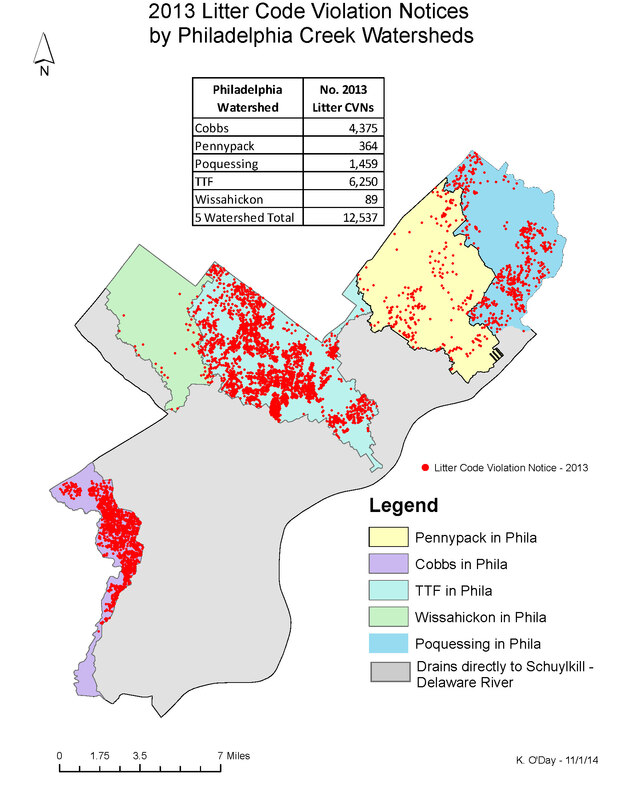 This map, prepared with ESRI’s ArcMap, shows the incidence of 2013 litter Code Violation Notices for the 5 small creek watersheds in Philadelphia. Clearly, the Tacony-Frankford and Cobbs Creek watersheds have much more serious litter conditions than than the Wissahickon and Pennypack Creek watersheds. This entry was posted in Phila Trash and tagged Cobbs Creek, Green City Clean Waters, Pennypack Creek, Philadelphia litter, Poquessing Creek, TTF Watershed, Wissahickon Creek. Bookmark the permalink.